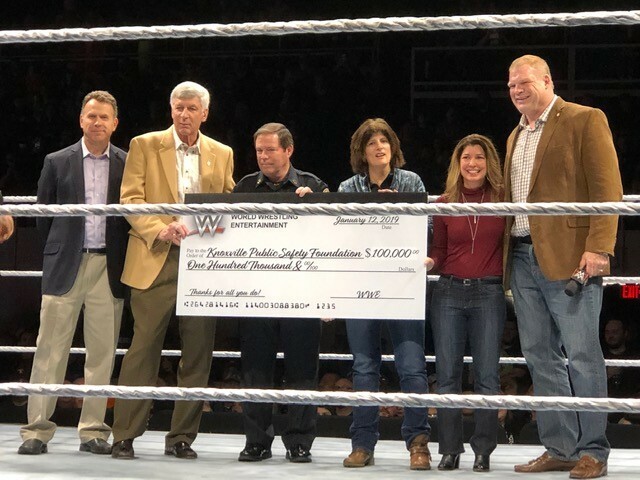 01/12/2019 The WWE (World Wrestling Entertainment) makes a $100,000 donation to the Knoxville Public Safety Foundation (KPSF). Pictured are the Knox County Mayor, Glen Jacobs, the Knox County Sheriff, the Chief of the Knoxville Police Department and KPSF board members. For the second year, the Blue Knights Law Enforcement Motorcycle Club of Tennessee 111, has contributed a portion of their annual ride proceeds remembering the September 11 tragedy to the Knoxville Public Safety Foundation (KPSF). The picture includes representatives of the Blue Knights and the KPSF Board at the check presentation.